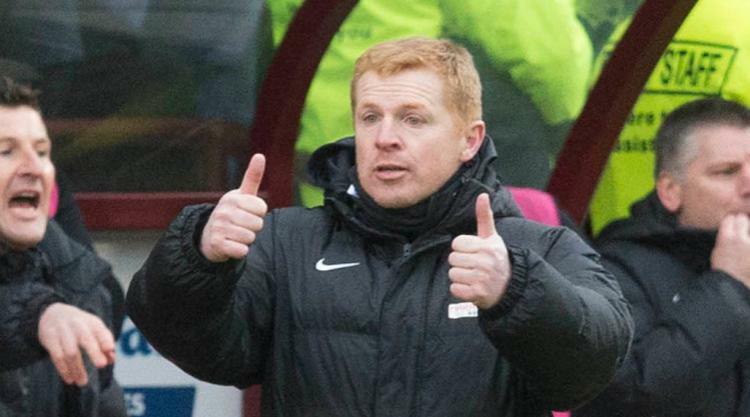 Hibernian head coach Neil Lennon is glad they can focus all their efforts on retaining the William Hill Scottish Cup after wrapping up the Ladbrokes Championship title. Lennon was frustrated with his side earlier on in the year when they sometimes failed to transfer their cup form to the league. But, after sealing the title and promotion last weekend, their priorities have shifted ahead of Saturday's Hampden semi-final against Aberdeen. "I had to emphasise that promotion was the priority, because it was becoming a bit of a distraction, especially the Hearts games when it meant so much to the Hibs fans to win it. "Winning the cup was huge, but the important thing was getting our Premiership status back. We have done that and now the important thing is to hold on to the cup. "I have to say the performances in the cup have been outstanding. They scored eight in a no-win situation against Bonnyrigg and then they had two epic games against Hearts where they played brilliantly, and then a tricky one against Ayr which they dispatched very comfortably. We hope it continues for Saturday." Aberdeen manager Derek McInnes does not feel Hibs will be more dangerous following their title win. McInnes said: "Everybody expected Hibs to win the league and I congratulate them, they'll be a good addition to the top flight. "But I wouldn't say they are more dangerous because they have won the league. "They will be playing with a lot of confidence. They have a lot of good players and we view them like a top-six side. "When you look at the experienced players they have and the fact they are used to winning in their own league, it can make it a bit more of a challenge, but they are facing my team, who are also playing well at the minute. "As it stands we're the second best team in the country and we feel they have a really tough challenge on their hands."